Welcome to our Robinhood Review – the commission free broker that changes everything! For many people the barrier to entry in stock trading is just too high – you need a lot of capital, learning how to trade the chart patterns is difficult and the fear of losing money is very real. What if I told you that you do not need more than $50 to learn trading? This use to be impossible because new traders would be charged $5 – $10 just for buying a shares and the same for selling them! Obviously, for new traders with $50 to trade with, this adds up quickly and ruins any chance of making any significant money. 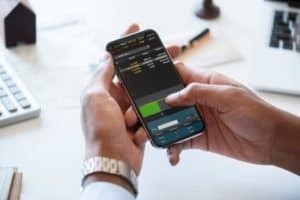 The trading app Robinhood is an awesome new brokerage account that you can access from your phone. Robinhood is truly revolutionary because it offers commission free trading – there is NO cost for buying or selling shares through Robinhood! Get a free share of a stock worth $3 – $300 if you sign-up for Robinhood today through my referral link! This is a revolutionary new concept for stock traders and a complete game changer for new traders or people who just want to try out investing online or stock trading with small amounts of money. Currently, Robinhood offers commission free trades on all the stocks listed on the major U.S exchanges. Robinhood was designed to be an avenue for the massive untapped market of millennial investors that want to invest in stocks but did not want the complicated and expensive burden of a conventional trading platform. I was one of the first users of the Robinhood app when it launched in 2014. I was on the waiting list that at the time was required due to the huge interest in the app. I knew as soon as I tried the app that I would end up writing this Robinhood review. I just had to tell other people about how great it was! I am so impressed with the Robinhood trading app. I have been using it for years now and I really have found nothing about it that I don’t love! I know your time is valuable so here is a list of the pros and cons for you! Free trades and flawless execution is my favorite aspect of this app. We have used the Robinhood app on Samsung Galaxy note and on an iPhone. We have used the app to make hundreds of trades and have no problems when we place an order. Getting completely FREE trades is really cool! I trade stocks with my wife – it is a joint effort that we do together. She has the Robinhood app on her phone as well and it is awesome that we can both just login and trade wherever we are. Mobile trading is truly amazing. With Robinhood, there is no worrying that you are away from your computer. This aspect of trading with the Robinhood app alone has saved us a good deal of money. We use a swing trade strategy so it’s not like we are glued to the computer all day – but it is still nice to be able to trade wherever we are. Mobile trading is awesome – you should read the story of Connor Bruggemann. Connor is a talented young trader who uses Robinhood during high school classes! Connor is a great trader who uses Robinhood while he is at school! So far, Connor has made several hundred thousands dollars trading stocks with Robinhood. Totally free trades is the best part of Robinhood – $0 to buy/sell shares and no hidden fees! There is no function to short sell stocks yet. This may be coming in the future though so stay tuned! You can’t execute orders in pre-market or post-market hours. This is pretty limiting and can be pretty annoying if news hits outside of normal market hours. You can actually trade in after hours but it is not part of the free package – you have to pay extra. Timothy Sykes (One of the most famous and experienced penny stock traders in world) really seems to dislike the Robinhood app. He has claimed that many people have had issues that have cost them a lot of money due to poor trade execution. Tim published this video where he discusses this issue and encourages traders not to be overly focused on getting free trades. Tim is primarily a day trader though and I agree that Robinhood may not be the best platform for a fast and precise day trading strategy. Robinhood makes money primarily by investing the funds in dormant users accounts. Yup that’s right, they lend out your money if it is just sitting in the account. They don’t pass on this interest to their customers so it is a big revenue source for them. The interest they make on the money is probably quite small but they have millions of users so it adds up to a significant amount. They also make money with additional functions in the app that are not free. While the basic buying and selling is free (which is all we do with the app), you do have to pay for borrowing money (margin trading, for more information see the section below, Robinhood Gold Review) and to have access to after hours trading. You can also pay if you want to be able to access any deposits into your account instantly. The free version makes you wait two days before any money deposits become available to trade with. Robinhood also makes money from the difference in the bid and ask price (the spread). They might only make a tiny fraction of a penny per share from this but when millions of shares are changing hands daily, it adds up to substantial revenue for them. Market makers pay a small fee to the broker (Robinhood) for sending them trades to process. They also have a lot of support from venture capital firms. The company has a current valuation around $5 Billion which is pretty crazy for a free app! Robinhood Review – Any hidden Robinhood Fees? There are no fees to trade on the U.S exchange with Robinhood. There are some fees to trade on foreign exchanges though ($15 – $35 per trade). It is totally free to transfer funds to and from your bank into Robinhood using ACH payment. If you want to use a wire transfer to put money in or out of your account it costs about $25. Robinhood Gold is their paid margin service where you can borrow money from them to trade stocks with. I have not used this part of the app but it looks like you have to borrow a minimum of $1000 a month and that costs you just $6 per month. This seems like a great deal to me! You pay the $6 regardless of whether you actually use the borrowed funds though. This is quite different from most brokerages that I have used in the past, where you pay for the borrowed money that you actually use. You need to have an account balance of a minimum of $2000 to be eligible for Robinhood Gold. This seems like amazing value for money as Robinhood does not even charge any interest for the borrowed money. It looks like you can borrow up to the cash balance in your account from Robinhood Gold. So, if you have $5000 in cash in your account then you can have access to a maximum $5000 in margin to increase your purchasing power. There is a sliding monthly fee scale depending on how much you want to borrow in margin. 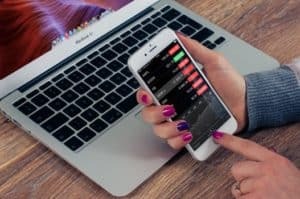 Robinhood Review – Is the Robinhood App Safe? I have never had any problems with money going missing or anything like that with Robinhood. They are a member of the Financial Industry Regulatory Authority (FINRA) which is regulated by the SEC. This helps to protect investors and users of Robinhood. All Robinhood accounts are also protected by the Securities Investor Protection Corporation (SIPC). This non-profit corporation exists to restore investor money to them if a brokerage like Robinhood goes bankrupt. This is all pretty reassuring! I love the user interface with this app. It is easy to navigate, intuitive and includes a ton of features to help you follow the stocks that you have bought and the ones that you are watching. The functionality is as good as any other online broker in my opinion – you can place limit orders, market orders and follow your overall portfolio value as well as the value of your individual stocks. I love the Robinhood app, even if Tim Sykes claims that it is ‘the most dangerous broker ever’. Perhaps it is dangerous if you are day trading and care about a few cents per share. I think for new investors and people that want to learn swing trading – Robinhood is the best thing to ever happen to them! Robinhood has lowered the barrier to entry for new traders and investors, which is a great thing. However, it does come with its own risks – be sure that if you are new to trading that you learn a good strategy. You can get your trading career started on a positive note by signing up for the Robinhood app via my affiliate link – if you do, you will get 1 share of a stock (randomly chosen) that could be worth up to a few hundred dollars! Try signing up now and see what you get! If you want some help with learning to trade, be sure to check out this free swing trading DVD (worth $1000) and training webinar from one of the best swing traders I have ever seen. If you are wondering what stocks to trade, you can also sign-up for free weekly email watch lists from the millionaire traders at Ragingbull.com. Hopefully you have found this Robinhood review helpful and Good luck with your trading journey! Any comments on this Robinhood review? Comment below if you like Robinhood or if you hate it! Amazing app! We love it because it is 100% FREE!